Korea says Japan's decision to slap a fresh ban on imports of U.S. beef will not affect the agreement between Seoul and Washington to resume American beef imports at the end of March. Agriculture Ministry officials say Korea and Japan have different conditions. For example, Korea will import meat only while keeping its ban on bone imports, as bones and bone marrow are believed to be linked to mad cow disease. 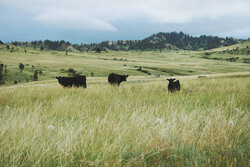 Cattle grazing in the tall grass of a Montana range. Taken 7/25/2005.